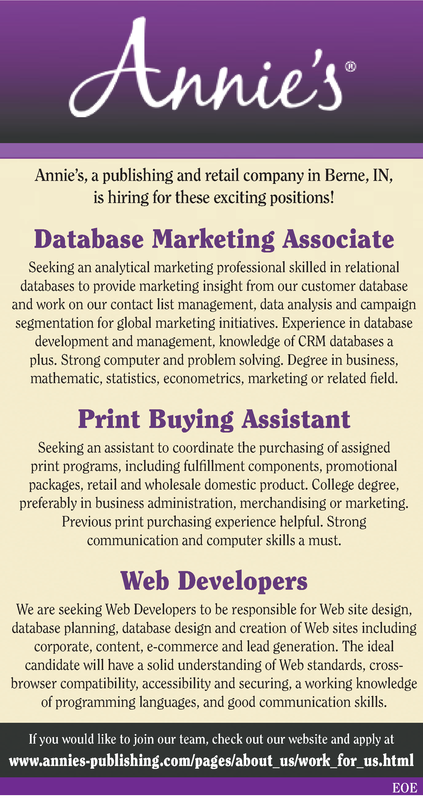 Annie's, a publishing and retail company in Berne, IN, is hiring for these exciting positions! Seeking an analytical marketing professional skilled in relational databases to provide marketing insight from our customer database and work on our contact list management, data analysis and campaign segmentation for global marketing initiatives. Experience in database development and management, knowledge of CRM databases a plus. Strong computer and problem solving. Degree in business, mathematic, statistics, econometrics, marketing or related field. Seeking an assistant to coordinate the purchasing of assigned print programs, including fulfillment components, promotional packages, retail and wholesale domestic product. College degree, preferably in business administration, merchandising or marketing. Previous print purchasing experience helpful. Strong communication and computer skills a must. We are seeking Web Developer to be responsible for Web site design, database planning, database design and creation of Web sites including corporate, content, e-commerce and lead generation. The ideal candidate will have a solid understanding of Web standards, cross-browser compatibility, accessibility and securing, a working knowledge of programming languages, and good communication skills. If you would like to join our team, Click Apply and Visit Our Website Today!